Ludus latrunculorum, or latrunculi, is a two person strategic board game that was played throughout the Roman Empire. It is considered generally as a military tactics game, with similarities to chess and draughts. Due to the limited historical sources, reconstruction of the basic structure and rules are difficult, and multiple interpretations have therefore emerged. It is challenging to identify the correct size of the latrunculi playing boards as it is often difficult for archaeologists to identify what a particular gridded board was used for. Boards with squares of 7x8, 8x8 and 9x10 were common across Roman Britain. The most plausible explanation is that the rules varied not only in the long timeline of the Roman Empire but likely from one region to another as well. A number of reconstructions of the rules have been written, perhaps most recently by Ulrich Schädler in 2001. The model was made in 2015 by Simon Pickard. Hnefatafl, or simply Tafl, is one of the oldest games in the world and can be traced back in various forms to the Vikings, Welsh, Saxons and Irish. It's name means 'King's Table' in old Norse. It was popular in Scandinavia during the Medieval period and is mentioned in several of the Norse Sagas. 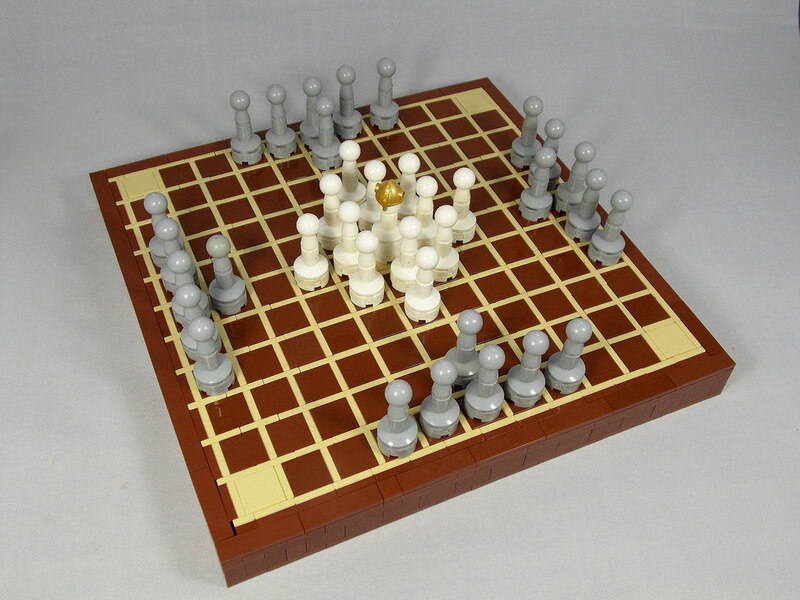 Hnefatafl is rare in that it is one of the few games that comprises of two unequal sides. 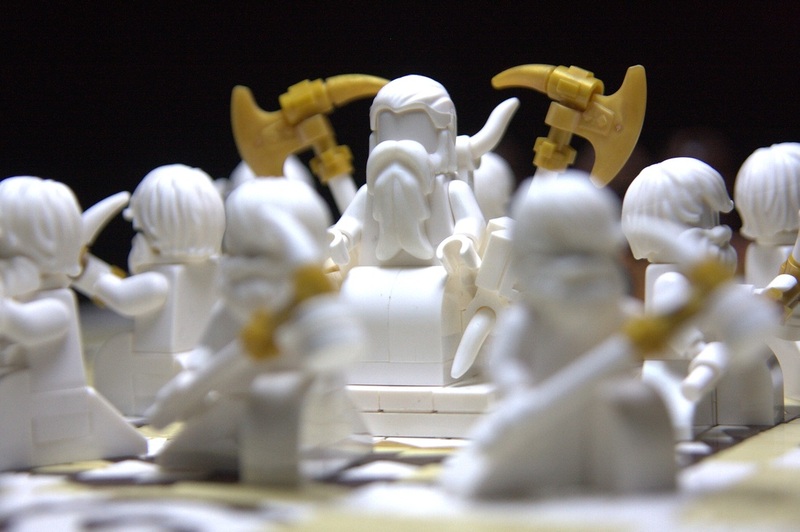 In Hnefatafl the defending side comprises twelve soldiers and a king, who start the game in the centre of the board. Their objective is for the king to escape by reaching any of the four corner squares. The attackers comprise twenty four soldiers positioned in four groups of four around the perimeter of the board. Their objective is to take the King. All pieces move like the Rook in chess and pieces are taken by "sandwiching" i.e. moving your piece so that an opponent's piece is trapped horizontally or vertically between two of yours. The attacking side starts first. It was made in 2016 by Simon Pickard. Ard Ri is a variant of the game Hnefatafl. It is associated with the Scottish Highlands with Ard Ri meaning 'High King' in Irish Gaelic. 'Irish Gaelic' you may ask? Well Scot's Gaelic is part of the same linguistic family and in fact comes from Ireland. 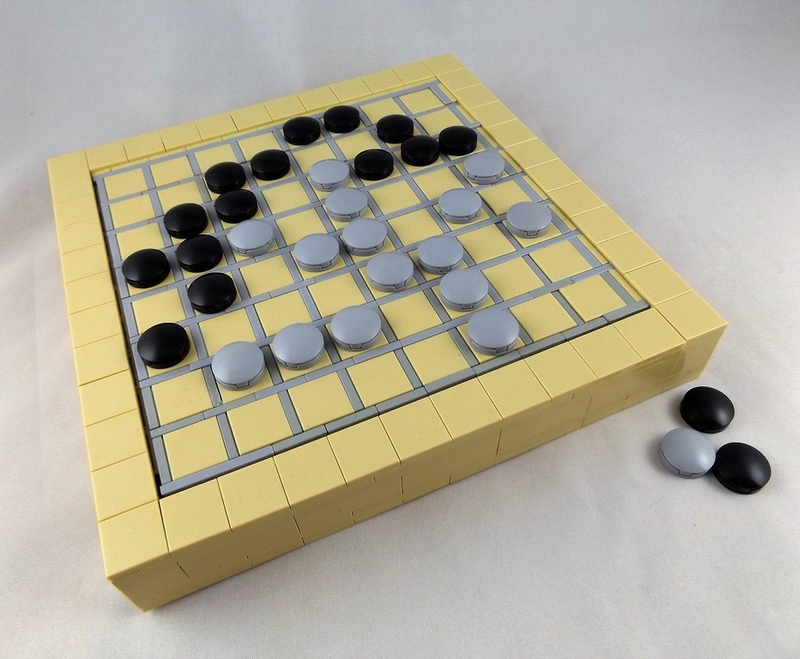 The game is played on a smaller board and with fewer pieces than standard Hnefatafl and it is one of the most challenging forms of the game. In Ard Ri the defending side comprises eight soldiers and a king, who start the game in the centre of the board. 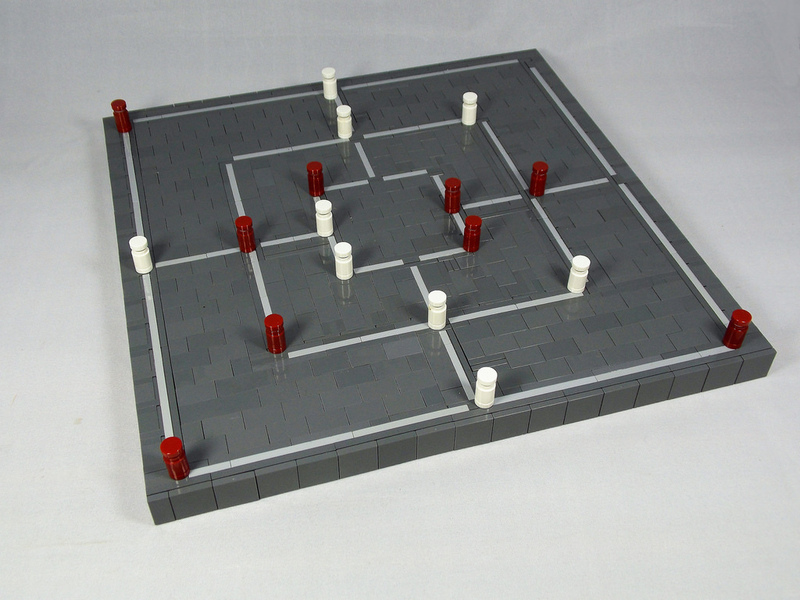 Unlike other forms of Hnefatafl, in Ard Ri, the defending side starts first. Otherwise, the rules and objectives are exactly the same as a standard version of the game. Ard Ri and Hnefatafl sets often contained intricately carved pieces and beautifully decorated boards and this is what we've tried to create here, taking inspiration from traditional designs and the iconic Uig Chessmen. The creation of this set in 2016 was in fact a collaborative between our Brick to the Past builder Dan Harris and his girlfriend, Dot Greaves. In fact it was Dot who created the intricate mosaic that decorates the playing board. The collaboration occurred by accident when Dan, having started the project, had to go away for a few nights for work. When he returned the mosaic was a lot more complete than when he left it; which just goes to show, when you leave your Lego lying around, beautiful things will happen. The king and his defenders. Nine Men's Morris is a strategy board game for two players dating at least to the Roman Empire. The basic aim of Nine Men's Morris is to make "mills". Mills are vertical or horizontal lines of three in a row. 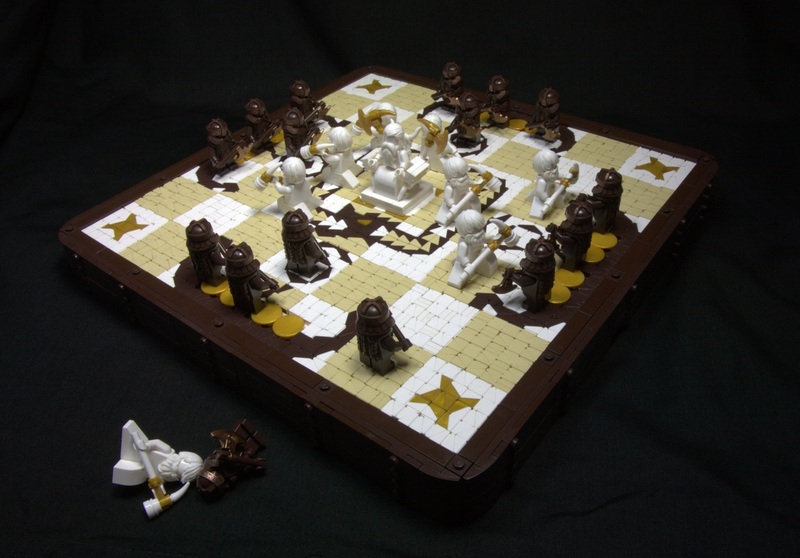 Every time this is achieved, an opponent's piece is removed, the overall objective being to reduce the number of opponent's pieces to less than three or to render the opponent unable to play. The board was made by Simon Pickard on 2016. All of these games are available to rent. Contact us for more information.